It's only when we meditate for its own sake—rather than trying to get something from it—that we find the results we're after, says Ed Halliwell. I came to meditation after years of trying to improve my life. I’d been stuck in depression for a long time, and meditation was the latest in a long line of wheezes meant to relieve the gloom. However, something curious happened when I followed the instructions given—I discovered it was impossible to meditate and struggle at the same time. Struggle still happened, for sure, but this was when I was “trying to meditate,” adding my own expectations or goals to the practice, or “not bothering to meditate,” just letting my habits of mind take over. When I actually meditated (staying present, opening to experience, coming back when the mind wandered), the sense of trying, hoping, wanting things to be different, or of giving in to despondency, hopelessness and fear—all this began to fall away. Instead came glimpses of the peace I had been desperately searching for. When I actually meditated (staying present, opening to experience, coming back when the mind wandered), the sense of trying, hoping, wanting things to be different, or of giving in to despondency, hopelessness and fear—all this began to fall away. I often see the same thing now in beginning practitioners. Many people come to mindfulness with a desire to be relieved of stress and difficulty, but only when they drop into meditation for its own sake, rather than trying to get something from it, do they find the results they were after. This makes the question of effort a little tricky. There is something to do—in order to make a discovery about the power of letting go, we have to show up, be prepared to learn, listen, and engage with the attitudes and practices suggested. But it’s easy to turn this effort into “struggling to meditate,” or conversely, to interpret the guidance on letting go as “not really caring”—just hang out, let your mind wander, whatever you fancy. I’ve found it helpful to distinguish here between intentions and goals. When we make mindfulness a goal, we have—by definition—moved out of the moment. We have created a discrepancy between what we’re experiencing now and what we would like to happen. This inevitably leads to tension—we might begin judging our current experience (or ourselves) as “not good enough,” “unacceptable,” or “to be got rid of.” This judgement can put us off—as the caption for one of my favourite cartoons puts it: “I know I’ve only been practicing for two minutes, but meditation is not bringing me the peace of mind I was promised.” When we make goals and measure our moments against them, we are virtually guaranteed disappointment. Making mindfulness an intention is different. Intentions are found (and re-found) in the present, so just by making one, you have already accomplished what you set out to do (well done, you!). An intention cannot fail, because it happens right now. With an intention, there is no required result—we are simply connecting to our chosen course. “I’m just going to practice, and see what happens.” Therefore we invite curiosity, a sense of experimentation: “Well, this is interesting, I wonder what’s going to happen now?” Intention has strength, as its rooted in reality, but also suppleness—holding to an intention doesn’t mean our actions can’t change, based on what we discover. Intentions come from inside, whereas goals are external. In connecting to an intention, we don’t have to look elsewhere for satisfaction—what we desire is already here as a seed within us. We may need some guidance and training to cultivate that seed, but relief comes when we realize we don’t need to try and be something we’re not. When we make mindfulness a goal, however, we turn it into a commodity, the benefits conditional on our having to “get it.” The implication being that we don’t currently have what we need—there is something missing, and we might miss out. This is a recipe for tension. It’s likely that some benefits of mindfulness come just from following a course we trust will be helpful. In other words, by choosing to practise, we already feel we’re on a path to well-being. When we make mindfulness a goal, however, we turn it into a commodity, the benefits conditional on our having to “get it.” The implication being that we don’t currently have what we need—there is something missing, and we might miss out. This is a recipe for tension. It is true that the traditional goal of practice is to relieve suffering. It is helpful to know this, otherwise we might not be inspired to begin, and or know we’re off course when we start thinking the goal is something else (lots of money, for example, or to be better than everyone else at paying attention). But we get in the way when we struggle to attain this goal directly, rather than through creating the conditions for it to happen through grace. It’s a bit like trying to fall asleep—it helps if you ready your bed and turn the lights down, but if you keep trying to drop off, it just won’t happen. At some point, you have to trust and let go. If you try to relieve your stress, you will have the experience of trying to relieve your stress. Giving ourselves over to practicing awareness and compassion, opening to, working with, and learning from what happens as best we can—these are helpful intentions in mindfulness practice. We can let these intentions carry us when it seems like nothing much is happening, or we aren’t getting what we’d like from our practice. Well-being comes from letting go of struggle—that’s the way to reach the goal. 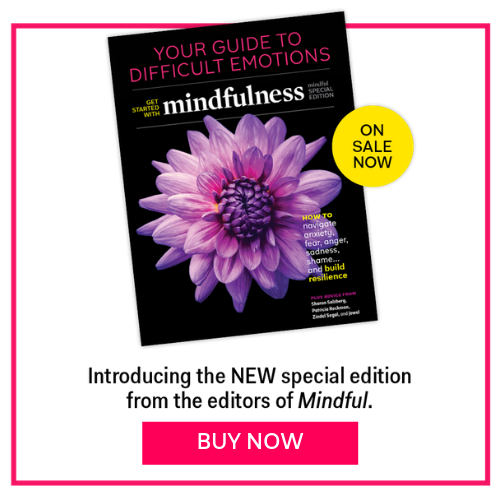 Ed Halliwell is a mindfulness teacher and writer, based in Sussex and London, UK. He is author of three books: Into The Heart of Mindfulness, How To Live Well By Paying Attentionand (as co-author)The Mindful Manifesto and teaches courses and retreats to public groups, in organizations and to individuals, face-to-face and online via Skype. He is also an advisor to The Mindfulness Initiative, which is supporting the Mindfulness All-Party Parliamentary Group to develop mindfulness-based policies for the UK.